Born in Ulster in 1943 Hamill started wrestling in 1963 under the name of Mike Judo Hamill and had his first bout at the King George VI Hall, May Street Belfast in a tag match against The Kydd Brothers. From making his debut Eddie wrestled regulary around Ulster/Ireland before making the switch to the mainland where he based himself in North Wales. In 1971 Eddie changed his ring name to Kung Fu and soon became a firm favourite with the fans, his career really started to take off and soon the TV bouts came calling. Broadcast in November 1974 Kung Fu made his first of many TV appearances against Clive Myers which Kung Fu claimed a victory 2-1. On the 24th of March 1976 Kung Fu appeared at the Mecca of British wrestling, The Royal Albert Hall against Kendo Nagasaki infront of over five thousand fans. This was a great bout with the action going back and forth with near fall after near fall, in the end Nagasaki unleashed his "Kamikazi Crash" to take the win via knockout. At the height of his wrestling in the UK Eddie was travelling over 2000 miles a week. 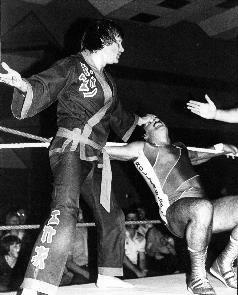 Kung Fu's fame spread around the world and in 1981 he went to Canada for a three month tour with Stu Hart's Stampede Wrestling taking on the likes of the Hart Brothers, Davey Boy Smith, Dynamite Kid, Jake Foley (johnny Palance), Tim Shea (Dave Taylor), and Robbie Stewart (Frank Cullen) throughout the Stampede territory on a weekly basis. Kung Fu proved so popular with Canadian fans he returned to Canada for another successful tour in 1982. Other countries toured by Kung Fu included Harrare, Bahrain, and The Sudan. Kung Fu was no stranger to championship titles and held the Commonwealth Middleweight belt whilst working for Brian Dixon in 1979, and also held the British Heavy Middleweight belt which he won from Rocky Moran early in 1986 until he lost it to Frank Cullen shortly afterwards, all this came after he was advised by by a promoter when young to "stick to the day job, your not very good". This same promoter returned a few years later and offered him extra money to appear on his shows. Kung Fu rates Mark rollerball Rocco, Dave Fit Finlay, Dynamite Kid, Kendo Nagasaki & Johnny Palance as his hardest bouts fought.